Getting a discount on Disney World Tickets for the Magic Kingdom, Epcot, Hollywood Studios, and Animal Kingdom Parks vary throughout the year and depending on whether you live in the State of Florida as a resident. This is our guide to getting discounts for theme park tickets at Disney World. If you are not a resident of the State of Florida, your options will center around buying a ticket that Disney calls “Magic Your Way”. Buying tickets for Disney World is now similar to ordering a coffee at Starbucks with options galore. You can choose multiple days and multiple parks. You can choose to add-on features like visiting multiple parks in the same day or including the water parks at Disney World during your stay. The more days you add to your ticket, the cheaper the price is per day. Universal Studios and SeaWorld Orlando also have deals where the longer you stay at their resort, the cheaper it is per day. It is for this reason that if you plan on visiting Orlando more than once over the next few years, your better bet may be to only visit one set of the major theme parks (Disney, Universal, or SeaWorld) during your stay and then include some local events and locations to help stretch out your vacation without breaking the bank. You can find out about local events going on in Orlando using our city guides on the lower right-hand side of this website or by choosing to find events going on “By Month” that you plan on visiting. If this is your first-ever trip to Disney World, you could theoretically get the 10-Day Magic Your Way ticket and still feel that you haven’t seen it all but if you have visited the parks several times in years past, we believe that some of the events going on locally during the non-summer months in Orlando featured on our website will provide as much of a great experience as visiting an Orlando theme park on the 5th or 6th day and will end up costing you less on your overall budget. Disney World will typically provide more discounts on their tickets during tougher economic times and less discounts during better economic times or during a period where they are opening up new signature attractions. The current discounts for their “Magic Your Way” tickets center around getting 5 days for the price of 3 if you add either their “Park-Hopper” option that allows you to visit multiple parks on the same day or their “Water Park” option that allows you to visit Typhoon Lagoon and Blizzard Beach during your stay. 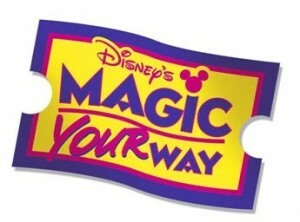 Click here to review and purchase your Disney World “Magic Your Way” tickets from Orbitz and to find out more information about current Disney ticket promotions. Disney typically saves some of their best ticket discounts for the residents of the State of Florida during their non-peak months outside of Summer, Christmas, and Spring Break. Over the last few years, they have had additional discounts for their 3-Day and 4-Day tickets during the early months of the year from January until around March. The 3-Day and 4-Day Florida Resident tickets also have blackout dates during the busier times of the year where you are unable to enter the park. Similar to the “Magic Your Way” tickets, there are many Annual Pass options for Florida Residents to choose from that can now be made on a monthly payment plan after putting down an initial down-payment (typically a one-day admission price to one of the parks). Note that Disney has raised the prices of annual passes pretty significantly over the last couple of years as the monthly payment-plan option has been very popular for them in adding new annual pass memberships so the discounts for annual passes for Florida Residents is not as good as they once where. Click here to visit Disney World’s website for Florida Residents to see current discounts (you will be prompted to enter your Florida Zip Code to see the ticket options). Please leave any questions that you have about purchasing your tickets to Disney World in the comments section below and we will be happy to answer them. Click here to view all current theme parks and attractions discounts in our forums and here for discounts on hotels and restaurants. This entry was posted in Attractions and tagged animal kingdom, discount, disney world, epcot, hollywood studios, magic kingdom, ticket, water parks. Bookmark the permalink.